If a person dies and has left behind a valid will, that person is said to have died testate. When a person dies without a will, he is said to have died intestate. The difference between the two can have substantial consequences for an heir or descendant. While you can usually dictate almost any terms of an estate distribution by will, each state has laws that govern distribution of estates for those who die without a will, or intestate. The testator, or person who leaves behind a valid will, is free to show favor to any beneficiary, whether that person is a relative or not. The most common restriction is that testators in most states cannot completely disinherit minor children. Beyond that, they can leave any part of their estate to their first-born children as they choose. 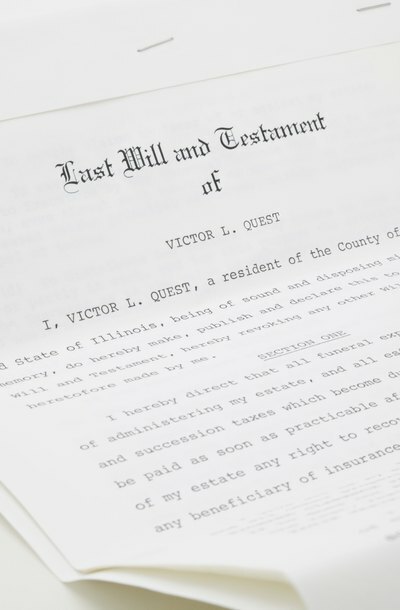 When a person dies without a will, the decisions about how to distribute that person’s estate are subject to state law, rather than the wishes of the deceased. Every state has intestate succession laws that specifically detail who will receive a portion of the decedent's estate and how much that will be. The immediate heirs under this type of estate distribution are usually the surviving spouse, if any, and the decedent’s children. Other relatives come into the picture only if none of these individuals have survived the deceased. If the decedent leaves behind a surviving spouse and only minor children, most states will give the entire estate to the surviving spouse. Leaving behind a surviving spouse and adult children results in the estate being divided up pursuant to the priority of heirs as set by each state's intestate laws. When it comes to dividing the decedent’s estate, there are two approaches. Per capita distribution means the entirety of the estate will be divided equally among the people still alive at the time of the decedent’s death, such as children. If a decedent has a child who predeceased him, that child’s progeny would not get a share of the estate as it would be divided among only the living children. Per stirpes distribution gives an equal share of the estate to each living child or to a predeceased child’s progeny in place of that child. Neither of these approaches to distributing estates grants special favor to a first-born child. State of New Mexico, County of Bernalillo: Who Are the Heirs?